SMOLLETTgate is a Brazen Conspiracy to Commit and Cover Up a Fake Hate Crime—Who and Why? Who: Only Deep State can orchestrate such a naked travesty of justice and get away with it. No one has ever seen anything like it. A highly over-rated but high-profile Hollywood actor pays for and commits a repugnant hate crime in the dark of night, the cops nail him on every angle, and the perp(s) gets off scot-free. 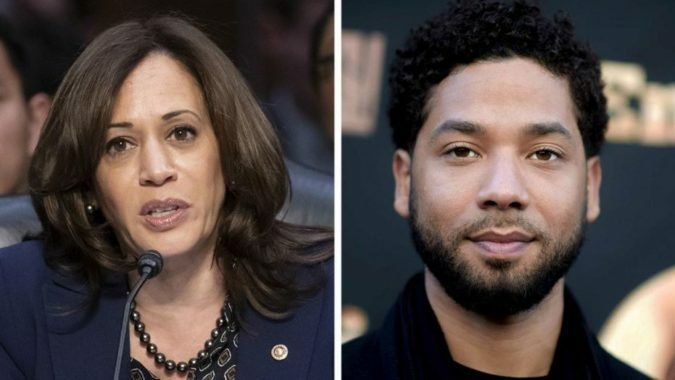 You can hear the baseless justifications from LA to Chicago to NYC: They’ll say it was a victimless crime where the only one hurt was Jussie Smollett himself. That’s exactly how the Left thinks … especially the Deep State liberals who populate the highest echelons of today’s “Criminal Injustice System”. However, this Chicago-LA-DC crime spree is a LOT deeper and broader than anyone knows. Here’s the short story as well as hidden back story to SMOLLETTgate. If the preceding exposé exposes one thing it’s that Jussie Smollett’s crime wave was just one piece of a massive conspiracy to start a race war across America prior to the 2020 election. This desperate and reckless attempt to exacerbate racial tensions is one of the few ways that the Democrats determined they could muster a POTUS victory. So now their misguided plan not only famously backfired, it has forced them to commit more crimes to cover it all up. Very few know but there are reasons why Chicago is the single most corrupt city in America today as it has been for many decades. Chicago is the covert headquarters for the globalist planned North American Union. In point of fact, the Windy City even has the most influential sub-chapter of the all-powerful Council on Foreign Relations—the Chicago Council on Global Affairs. 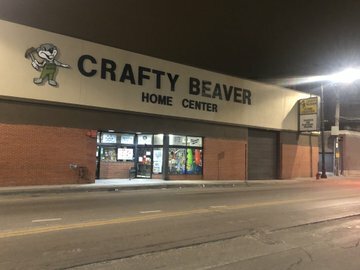 Chicago is also the de facto capital of the Military-Industrial Complex and where many of the Neocon crime families reside and/or originate from. Here’s just one example of what takes places under the auspices of the quietly powerful Chicago Council on Global Affairs. Which is precisely why the relatively low-level prosecutors — Cook County State’s Attorney Kim Foxx and First Assistant Cook County State’s Attorney Joseph Magats — were empowered by their Deep State masters to recklessly commit prosecutorial misconduct in broad daylight. What follows is just a smattering of Alt Media responses to this unparalleled “naked travesty of justice”. Unparalleled not because this type of serious official misconduct does not occur across America 24/7; rather, it’s unprecedented because the state-sponsored crimes are being purposefully perpetrated for every American to witness. You mean Smollett bought his way out of a 16-count felony indictment with $10K?! In other words, TPTB really want the entire body politic talking about this perfidious and glaring cover-up. Not only does this Chicago high drama serve as an extraordinary distraction from their catastrophic roll-out of 5G, it’s diverting attention from so many other criminal conspiracies being conducted against the American people by the all-pervasive Government-Corporate Complex. There’s no question that Jussie Smollett’s felony spree was far from being a victimless crime wave. In fact, the entire U.S. citizenry were the countless victims of this heinous hate crime. But it is the Right, and especially the Patriot Movement, that was the real target of the carefully designed Operation “Crafty Beaver”. The true intent of this massive conspiracy to trigger a race war had such far-reaching repercussions that the perps at the top felt they HAD NO CHOICE BUT TO COVER IT UP. Yes, it really is that big of a conspiracy that deeply involved the highest echelons of the US government, Hollywood moguls, the Sultans of Silicon Valley and, of course, the CIA’s Mockingbird Media. The historical record and hysterical reaction to Smollett’s original crime wave clearly proves circumstantially that every major propaganda organ of the Mainstream Media was a co-conspirator in this plot to further divide the Right from the Left. The immediate participation of so many Hollywood celebrities and Deep State VIPs indicated a highly coordinated scheme to start a race war. 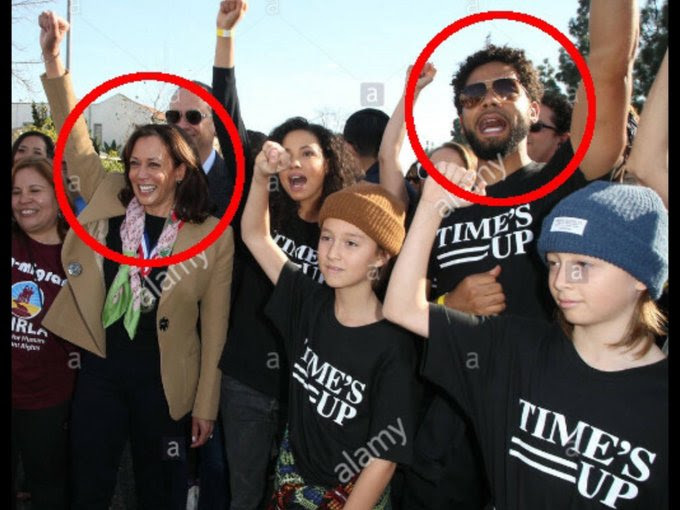 Perhaps the greatest urgency to put this criminal conspiracy to sleep (so they thought) is due to the direct connections between Sen. Kamala Harris and Jussie Smollett (see photo above). The past collaborations between these two characters (aka bad actors) were too many and too profound to gloss over. Simply put, if he went down; she would go down. The whole country already knows that she has gone down in her rise to the top; however, few are aware of the true depth and breadth of Kamala’s past as a career criminal in the California political realm. Much more significantly, everything points to Harris as being groomed as the “female Obama”. Therefore, her candidacy must be untainted at all costs should the DEMs decide to nominate her. She is the most likely choice of Deep State to be anointed as the first female POTUS, whenever that times comes. Keeping her resume unsullied with Operation “Crafty Beaver”, then. became a super high priority for her Deep State masters. Heads have been exploding all over the MSM since the Russiagate hoax fell apart. The total meltdown throughout the entire Left blogosphere has been swift and sure. So traumatized are many Russiagaters that they are now manifesting an advanced and dangerous form of Trump derangement syndrome. Given this ever-worsening predicament, even Deep State was forced to do something about it so they broke the cycle with a meaningful political gimme. Hence, the most recent phase of SMOLLETTgate was born. By dropping the charges, not only did the Left pause from their embarrassing hysterics about the Mueller Report letdown, they were given the subliminal message that the Deep State was still in charge regardless of the ostensible and unexpected outcome of the Special Counsel Investigation. The timing of SMOLLETTgate blowing wide open right on the heels of the Mueller Report is a dead giveaway. The whole country has been consumed with AG Barr’s summary of the report for very good reason, as seen in this highly consequential 4-page document. Whenever Deep State is compelled to blatantly cover up such a notorious crime spree, there are always multiple reasons for doing so. Clearly, the Chicago-LA-DC dimensions to this conspiracy are so radioactive that the decision-makers moved to conceal it every way they could, even if it meant someone being charged with misprision of felony. 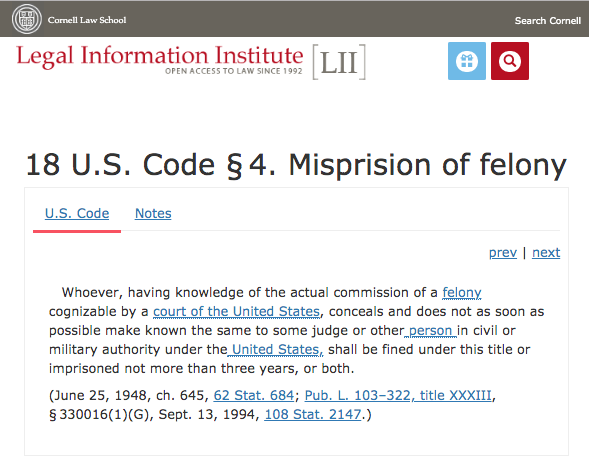 Prosecutor or not, an officer of the court cannot get away with covering up a felony, especially a 16-count felony, of which they possess clear evidence. Hence, the greatest consequence of this whole ordeal is the utter destruction of the rule of law in America. This, then, is one of the primary goals of TPTB: to convince the body politic that the rule of law has been destroyed. And so it has been. Except that there never really was any rule of law, only the appearance of it. The two-tiered “Criminal Injustice System” has reared its ugly head yet again for all to see … … … at a critical moment when real justice is direly needed to prevent the outright collapse of the Republic.